“Shadowed Arch” by Kate Starling, 30″ x 40″. Watching Colleen Howe set up her easel during the “wet paint” painting session is a defining moment. I get it. On the spot painting. 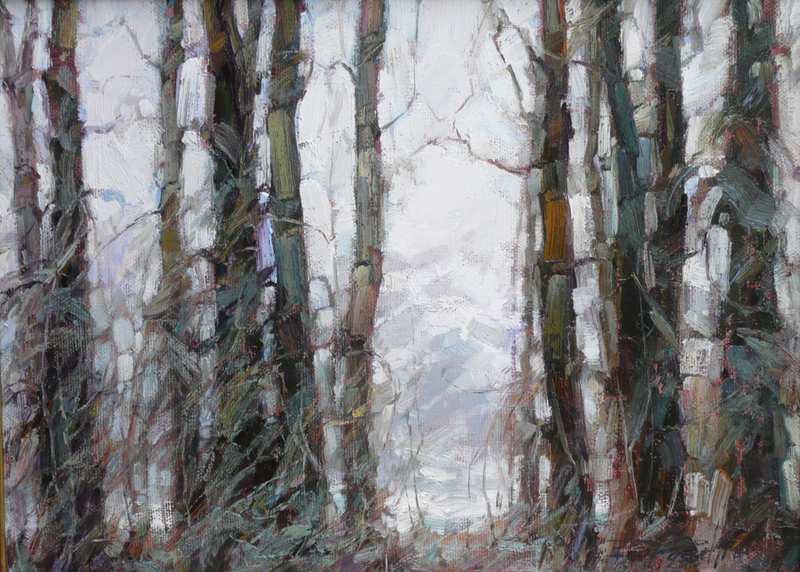 I watch Colleen Howe squeezing tubes of oil onto her palette, squinting into the distance. She is soon immersed in her personal world. The painting that she is working on will go on sale within hours, thus, wet-painting. On the spot painting means making art, not subjects. 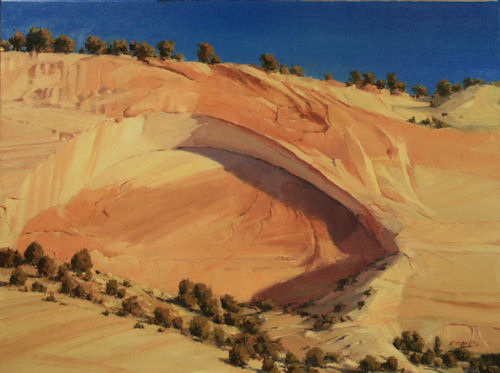 “On the spot painting” is the subject of Utah artist Kate Starling and Colorado artist Len Chmiel’s joint presentation this weekend at Maynard Dixon Country, the annual event held in the remote town of Mount Carmel that was home to the artist. Viewing Kate Starling’s sketchbook one can see just the suggestion of the subject. She prefers “painting every day outdoors, sun, rain, wind,” always considering how to see her subject — not the whole, but what is compelling, the play of light, or how a cloud causes the slot canyon to melt into shadow. Obviously, the process can only take place outside, on the ground. On the spot painting is also about on the spot knowledge. Len Chmiel says that “while painting water, it isn’t a bad thing to be a fly fisher, no better way to study water. Then interpret your own authenticity.” Kate Starling says that after composing a subject, she likes to do something to surprise herself. But you can only do it if you are not mesmerized by the subject. The former National Park Ranger’s knowledge of geology is something she falls back on without thinking about it at all. One wouldn’t say the artists gathered around Starling and Chmiel are incredulous when Chmiel mentions the use of Photoshop, but some do turn to each other as if to say, “Did he really say ‘Photoshop’?” He did. “I might take 3 or 4 images and stack the buggers up to see if I missed something. Look, I have close to 1500 pieces of art sold and hanging out there. I use every tool that I can when I’m in the field, but I still have to bring the painting or sketch in. And finish it to my specifications. We’re lying anyhow — so what is the difference.” He has shaken up the 100 or so artists gathered, and ends his statement: “Photos have detail in them — at times I only have 45 minutes out there ’on the spot.’ I don’t go for perfection out there. My favorite position at all times is “What if?” And Photoshop allows me to take the chance without all of the sketching. I do all of my drawing with my brushes and raw paint anyway. And I want to find a way to get more and more paint on the canvas any damn way that I can.” Starling does not use photos extensively, but does create abstract sketches, and if there is a photo of the subject, she uses it for shadowing, and to correct the many changes of light that take place in the field. Starling and Chmiel continue their presentation. We laugh, and the sun comes out, backlighting the cottonwoods. “Finery” by Bonnie Posselli, winner of the Popular Choice Award in the Maynard Dixon Invitational 2010.